We thought this was going to be another Year of the Woman. Instead, it was the Year the White Man Roared. Voters in this country sure did want change. Wanted it so much they took risks they’ve never taken before in the country’s history. Donald Trump will be the first president in the nation’s 240-year history with zero experience in either government or the military. In other words, we’ve taken a flyer on the biggest outsider candidate in American history. I sure didn’t see this coming. Call me flabbergasted. But there are some huge clues to what just happened in the national exit poll of voters. That poll asked 23,538 voters why they voted the way they did — and some of the answers are astounding. Trump won these change-minded voters by an incredible 83 percent, to just 14 percent for Clinton. She won every other category (things like “has the right experience” or “has good judgment”). What’s notable is that Trump’s actual policies — building a wall with Mexico, deporting unauthorized immigrants and so forth — are broadly disliked, according to the survey. Voters also said by two-to-one margins that Trump is unqualified to be president, doesn’t have the proper temperament for the job and mistreats women. But they voted for him anyway. Part of this was surely due to dislike and distrust of Clinton. But something more was going on. The exit poll shows there was indeed a historic gender gap — the biggest ever recorded. But instead of it being dominated by women, it was tilted more toward men turning out in droves for Trump. Specifically, white men. If nothing else, most everybody was wrong about which party is most likely to devolve into a civil war. The prime candidate for that now is the Democrats, as they now are likely to find themselves completely out of power at the national level. As much as voters in the Rust Belt and Florida wanted change so badly that they voted for a reality-TV star, voters here picked more of the same. 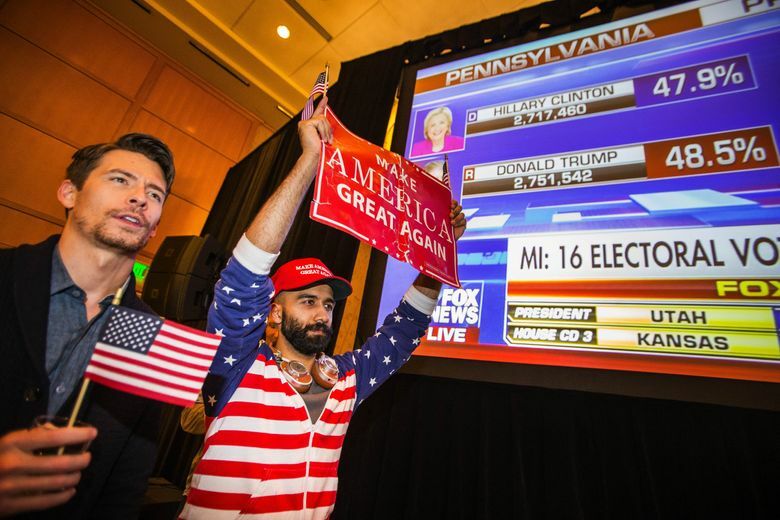 In Washington, the results were far more routine — though even here, the intense polarization of politics just deepened. Democrats mostly ran the table at the statewide level, as they usually do here. In fact an exit poll for our state showed we had the type of politics that forecasters had expected elsewhere in the national presidential race. Women here dominated the voting, going strongly for Hillary Clinton, by 28 percentage points. Washington state men went for Clinton as well, but by only 2 points (44 to 42 percent). That means there was a 26-point gender gap here. Down ballot, the effect was brutal for Republicans in King County, as Democrats appear to be deposing some GOP incumbents in local legislative districts, such as state Sen. Steve Litzow, R-Mercer Island. But it wasn’t expected to be enough to take over the state Senate or change much in local politics, as Republicans were doing far better outside King County. More than ever we are like two states, residing inside a split nation. For all his rhetorical gifts and his unique life story, President Obama obviously failed in his quest to get us to see that we’re more purple than we are red or blue. I can’t believe I’m writing the following words. But now it’s going to be up to a President Trump to bring us all together.